I'm getting a bad a rattling sound which only appers when I go over a non smooth road or when going over humps. Mechanic could not replicate the fault by raising the car on the lift and tugging at stuff. Any suggestions as its really getting annoying and dont want my wife to break down in it. Anti roll bar drop link/s. Be aware there are two different types fitted to the Mk 1. I also had to replace a wishbone for Nearside Front Suspension arm rubber mounting which had failed completely. Then at it's next MOT I got "Nearside Front Suspension arm rubber mounting deteriorated resulting in excessive movement" ? Another possible rattle is the exhaust against the inner sill, but that is usually evident on corners. Thanks for the reply and feedback. I forgot to mention that the exhaust is fine, that was the first thing I checked and mechanic said it was all secure. 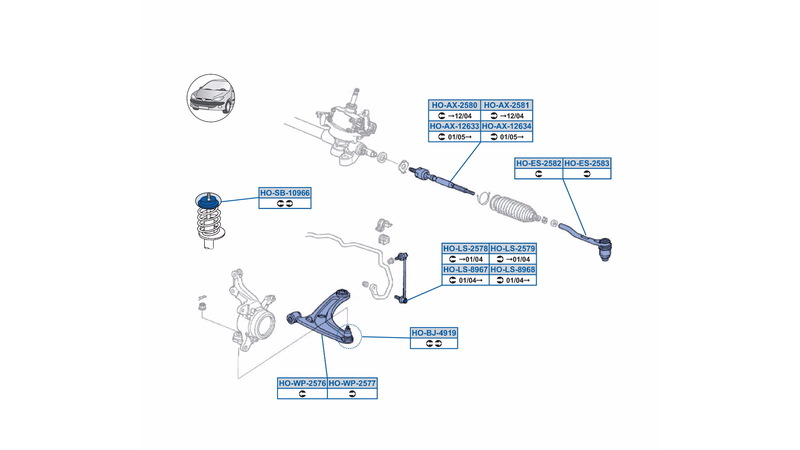 Which is the anti roll bar drop links in that image you posted? How expensive and big a job can this be? I’m based in NW London. The short, dark blue, vertical bar is the drop link. Two cost me £24. Fitting depends on your garage, but it is not a big job. I fitted one when the wishbone was changed (Y shaped piece in image, which cost me £32), and my local tyre fitters fitted the second one, free, when they fitted two tyres and checked the alignment for me. Thx you. Will get another mechanic to look at this and suggest your comments. Is it possible to replicate this knocking / rattling sound somehow when on the lift? If the drop link is well shot you can, but if there is just a little slack the lift raises the body and the weight of the wheel and suspension takes up the slack. It is difficult to rattle wheel and suspension up and down enough to get a rattle. I have experienced the same problem with my last three cars. A Vauxhall Cavalier, a Volvo S40, and now the Jazz. I put it down to the preponderance of 20 mph zones, and their dreaded "speed bumps", around here. Same thing happened to my Jazz a few years ago. Both drop links were replaced and noise disapeared. With the car on a flat level surface, rock the car from side to side and you will hear them clicking if they are bad. Grasp each joint in turn from underneath as the car is rocked to identify which one is worn. The clicking will stop, and you should be able to feel any play. I’m getting them changed this morning - £90 for both inc labour by a small garage. He drove it for 30 sec and suggested the same to me without me suggesting. Then also rocked the car. Hopefully that’s a fair price for NW London? I’ve got lots of 20mph speed bumps on my road. Some are higher/ harder to drive over then the others for some strange reason. Is it worth trying to put the claim to the council? That’s £20 for each to fit? Just seen that this website does the front drop link arms for £7.95 each or £13.95 for the pair. Might pick up a pair as I have heard this knocking sound once I rock the car side to side. Had them replaced, knocking sound seems to have stopped so thx for that. Feel a bit annoyed inlaid £90 but there you go. Checked with Lloyd’s motor spares and they quoted £48+vat for the pair. Not sure if they are better quality than the £13.95 pair ones. Suppose I would be tempted too. There’s a video on YouTube about replacing them as well and it seems really easy. They are a dawdle to replace as long as you can stop them turning while you undo them. My mechanic just ground through the fixing.